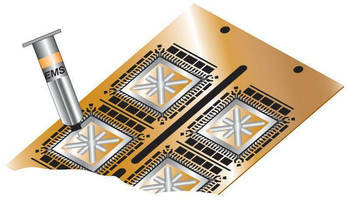 Conductive Adhesive features low-temperature cure. Designed for die attach and general circuit assembly applications, CA-180 cures in 30 min at 80Â°C,Â 3 min at 100Â°C or 10 sec at 150Â°C with electrical conductivity of 4 x 10-5 ohm-cm. This low-temperature cure conductive adhesiveÂ hasÂ 48 hr work life andÂ 12,000 cP viscosity at 5 rpm forÂ facilitated needle dispensing or application by pin transfer. Applications include those where components are temperature-sensitive and require high conductivity interconnects. DELAWARE, OH — Engineered Material Systems, a leading global supplier of electronic materials for circuit assembly applications, introduces its newest conductive adhesive – CA-180. The low-temperature cure conductive adhesive has been designed for die attach and general circuit assembly applications. CA-180 cures in 30 minutes at 80°C, three minutes at 100°C or 10 seconds at 150°C with an electrical conductivity of 4 x 10-5 ohm-cm. Applications where the components are temperature-sensitive and require high conductivity interconnects are ideal for this material. CA-180 has a 48-hour work life and a 12,000 cP viscosity at 5 rpm for easy needle dispensing or application by pin transfer. CA-180 was developed to pass the rigorous reliability requirements in die attach, disk drive, camera module, photonics and circuit assembly applications. CA-180 is the latest addition to Engineered Material Systems’ extensive line of electronic materials for semiconductor, circuit assembly, photovoltaic, printer head, camera module, disk drive and photonic applications. For more information about the CA-180 low temperature curing adhesive or to learn how Engineered Material Systems can define, develop and create an engineered material solution that is right for your company, visit www.emsadhesives.com.